In Starship Troopers, Jaun “Johnnie” Rico signs up with the Federal Service and struggles through the toughest bootcamp in the Universe, determined to make it as a cap trooper with the Terran Mobile Infantry. But the hardest part is yet to come – when he’s thrown into battle against an enemy unlike anything mankind has faced before. Looking for futuristic weaponry, space soldiers, and nasty aliens? This is the book for you. Looking for a mental workout to get the old lemon throbbing? This is also the book for you. Or to put it another way: are you a sci-fi enthusiast with a taste for politics and moral philosophy? Read Starship Troopers. It has both in equal measure. Much has been made of Heinlein’s “elegantly drawn battle scenes,” but for my money, the most exciting scenes take place in the classroom. The discussions there are just as riveting as anything that happens in combat, if not more so. 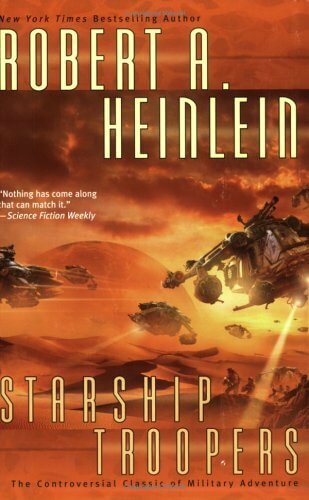 The story is swiftly paced and gripping, but it’s clear from the get-go that Heinlein is less concerned with entertaining us than he is with making us stop and think. The society of the future, as imagined here, is one where full citizenship – and most importantly, the right to vote – can only gained through military service. Signing up isn’t mandatory, and those who won’t (or can’t) serve are free to pursue their lives as they see fit. But they aren’t allowed to meddle in politics. Only those who have paid the price for liberty are allowed to wield the power it begets, for they alone know its great and terrible value. That is Heinlein’s contention anyway. His arguments are cogent and understandable; whether I agree with them is another matter altogether. Nor am I convinced that his militaristic society would actually work. Like most utopias, it seems feasible within the confines of the novel – I just doubt it would play out the same way in real life. The Bugs themselves are symbolic of the communist political structure which was on the rise during the Cold War. Interestingly enough, one of the characters points out the the Bugs’ “communism” only works because the species is biologically adapted to it. I’ve barely scratched the surface of what this novel has to offer, and if you’re up for an intellectual wrestling match, I’d encourage you to pick it up for yourself. I’ll simply make one more observation: the trooper suits are awesome. A suit isn’t a space suit – although it can serve as one. It is not primarily armor – although the Knights of the Round Table were not armored as well as we are. It isn’t a tank – but a single M.I. private could take on a squadron of those things and knock them off unassisted if anybody was silly enough to put tanks against M.I. A suit is not a ship but it can fly, a little – on the other hand neither spaceships nor atmosphere craft can fight against a man in a suit except by saturation bombing of the area he’s in (like burning down a house to get one flea!). Contrariwise we can do many things that no ship – air, submersible, or space – can do. There are a dozen different ways of delivering destruction in impersonal wholesale, via ships and missiles of one sort or another, catastrophes so widespread, so unselective, that the war is over because that planet or nation has ceased to exist. What we do is entirely different. We make war as personal as a punch in the nose. We can be selective, applying precisely the required amount of pressure at the specified point as a designated time – we’ve never been told to go down and kill or capture all left-handed redheads in a particular area, but if the tell us to, we can. We will. I want one of those things for Christmas. And you’re right, the suits are totally awesome. Though, they do seem a bit trigger happy with the nukes, which I’ve noticed in a lot of old sci-fi.